Note: Original photograph remains unaltered. Restored photograph is provided on CD disk as high-resolution uncompressed tiff from which prints may be provided of the restored image. 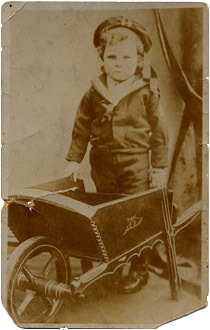 Here is a postcard-sized photograph of Sidney Samuel Spurgeon, aged four in 1890 and original wheelbarrow. 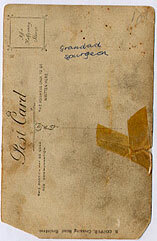 This old postcard sized photograph copy is in sepia tone and is torn and is very faded. 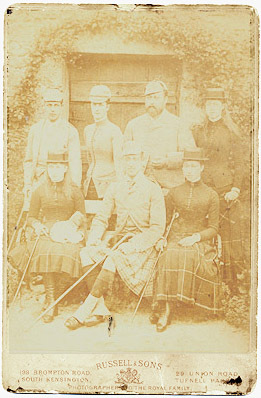 It is a later copy print from a studio 'cabinet' photograph. Photographic emulsions were less sensitive then, and to achieve adequate results, involved extended exposure times. Our subject, young Sid, would have had to adopt an 'absolutely still' pose for some seconds. Any movement of Sid's hands or facial expression caused blurring and under-exposure of the plate. So, from the beginning, young Sid's face appeared too light and indistinct. Other problems with this photograph, which is typical of that found amongst old family photographs, include crazing, scratches, soiling, and tears. The fibres within the paper emulsion unfortunately merge with the image areas. Exposure to light from many years display in a picture frame have caused the image to fade. Sometimes also from inadequate chemical fixing and rinsing when the contact print was developed. The restored photograph showing removal of torn areas, cleaning, and enhancement of the image including retouching of eyes, nose, and face. Note: Original print remains unaltered. Picture is provided on CD picture disk as a high-resolution uncompressed tiff with new prints obtained from the restored image. Here is the very same toy barrow from 1890 as it exists today. The original green and red paintwork and monogram initials "SS~"can be seen on the side. The steel strap across the barrow is now dark and rusty. The photographer in 1890 photograph, you will notice, placed masking over the brightly polished new steel band to cut out the glare. 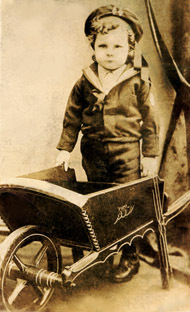 Young Sidney grew up and was to use his barrow throughout his life. He was devoted to his vegetable garden. 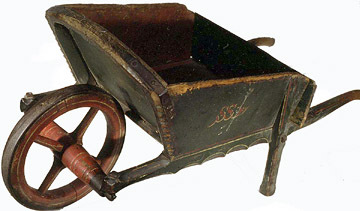 The barrow was on display at Saffron Walden Museum for several years as part of their toy collection. Here is an old family photograph from 1884. The sepia tone cabinet card mounted albumen print is again much faded. The image is washed out, faint, and indistinct overall. There is damage and spotting present after 120 years. It was possible to date this image from the photographer Russell and Sons Tufnell Park studio address which ran from 1881 - 1884. The restored image. Now details of both exterior backround and foreground family members can be clearly seen. 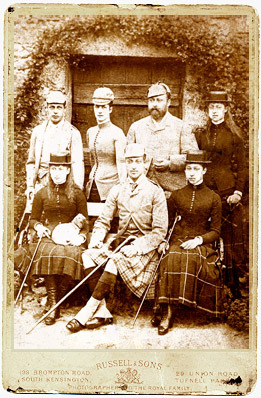 Edward VII (1841-1910), Reigned 1901-10. Alexandra of Denmark (1844-1925), Queen of Edward VII.